Opening up to receive angel intuitions can be like building a tower with ABC wooden toy blocks. One block letter of experience stacked onto another similitude, and so on, slowly brings a higher view of greater understanding. The building materials in our life, what we value, the angels can use as a teaching tool to teach us to go beyond our current limited beliefs. Symbols represent a spiritual reality that extend beyond the physical object. Step by step angel clues are revealed without realizing what's up until they are stacked together. That's the beauty of it all, we can't make anything happen by human planning that will have any lasting happiness. The joy is in the moment, the eternal present, the Now. So what does all of this have to do with pelicans? Synchronicity, of course. The language of the angels. Let me explain. 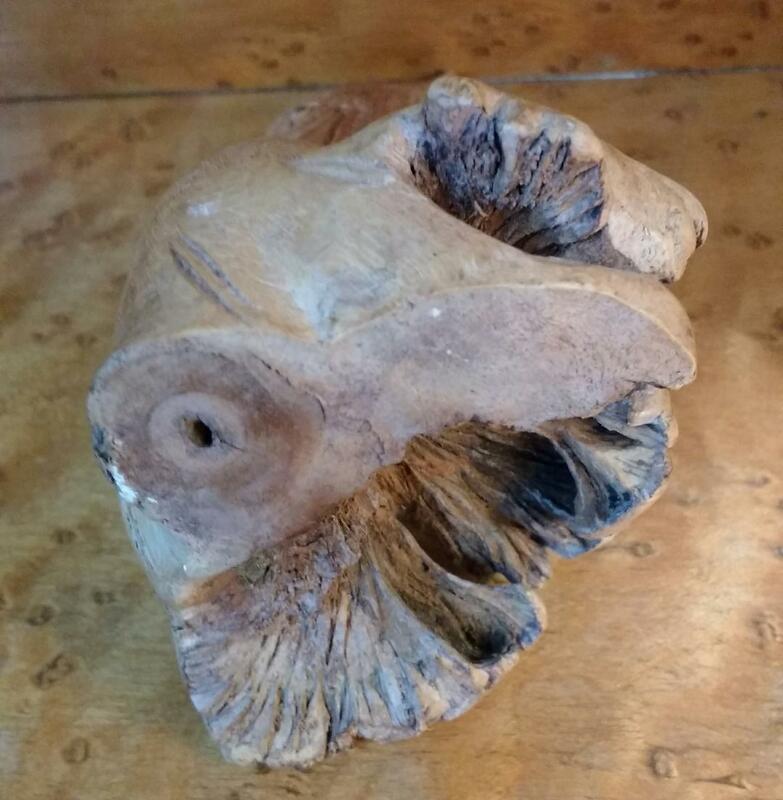 An earlier blog describing a spontaneous hike to visit Old Methuselah, the 500-year-old bald cypress, last week brought home another lesson that caught me by surprise this morning. Cypress trees are symbolic of death, life, and resurrection--the heavens are calling. I remembered these towering wetland trees also remind us to ponder the meaning underlying our human experiences. Synchronicity was at play. Recently I'd sent a friend in Virginia Beach a note card, and, at the last minute, used a special pelican postage stamp on the envelope. 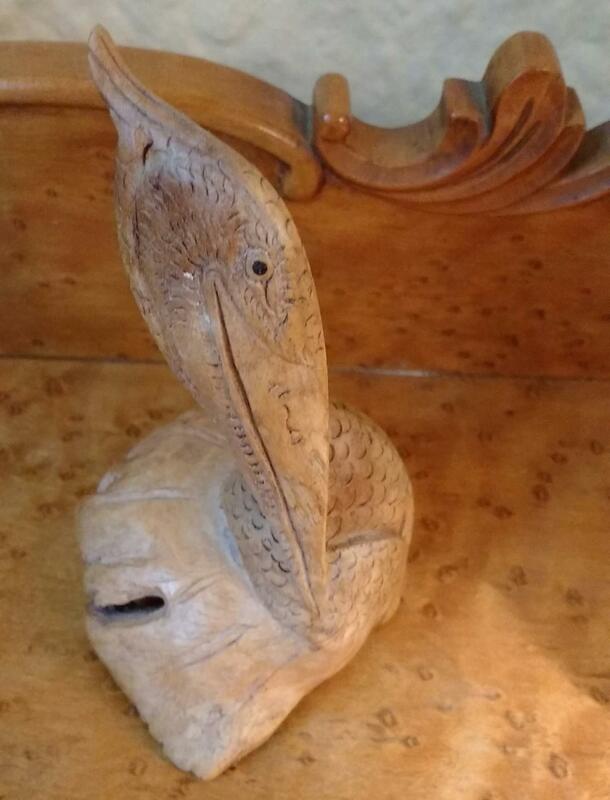 Turns out, her husband had just created a pelican from scratch, and she sent a picture of his favorite avian skillfully made of wood. Before sun up this morning, an angel message about pelicans floated by as I recalled a small hand-carved pelican that had surfaced at a local thrift shop years ago. Vaguely, now I wondered if it was made of cypress wood like Old Methuselah. Curious, I got out of bed to take a look. Sure enough, an ugly chunk of old cypress wood had been masterfully transformed into a buoyant pelican, riding the rough surf. A symbol of hope. Studying the exquisite detail of my long forgotten pelican, brought a smile. What had been a chunk of twisted, useless wood had become a beautiful symbol of transformation, in the right hands. I realized that message of the cypress tree and the pelican was a compound idea of heightened awareness in this world of seeming chaotic constant disruptions. Pelicans are buoyant and can easily float in all kinds of weather; they are unsinkable. These magnificent birds plunge straight down into the depths of the sea, and soon pop back up with a fish. A positive lesson had surfaced -- no matter how hard life gets, no matter how deep down you seem to plunge, you, too, can pop back up to the surface! Water represents emotions, and with pelican we are reminded how not to be overcome by them, don't sink down to the depths. Rise up and float on the waves. Renewed buoyancy and unselfishness are the keynote of this precious winged one, also known as a symbol of the Christ. Enjoy today and give thanks to God and His angels.